Move towards the back of the house. If they approach the front, try to leave through the back. Do Equestrian soldiers wear boots? If so then we can rule them out. You listened for a while, trying to gain information about strangers by sound they were emitting. >You memorized the image of few Equestrian soldiers you've seen on the streets and in your block. >Medical Service and Anti-Aircraft Defence didn't wear any shoes, and docs hadn't even their hooves hobnailed. >But first line soldiers actually wore some light leg armour, you wasn't sure about the boots because your memory is blurred. 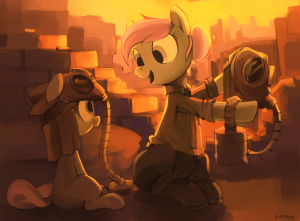 >You were ready to escape swiftly in case of intrusion, but it looks like nopony tried to get in your shelter. >By retreating into deeps of cottage you used as a shelter you neglected possibility of checking who were they by your own eyes. >Steps move towards gunfire, quieter and quieter. Finally, they have faded away.